Last night the Vancouver Canucks took on the last place Buffalo Sabres, and was the first game that I have attended in five seasons. As all you Vancouverites know, the Canucks are teetering on play off extinction for the 2014 season, and are currently three points behind the final play off spot holders, the Phoenix Coyotes. Last night the Canucks did come out on top as they were able to score four goals to double the Sabres in a four to two win. The majority of the Canucks scoring came from the third line, highlighting arguably Zack Kassian's best game in his young career. Living up to his nickname, the "Kassassin" picked up four assists and was throwing the opposing Sabres players around like limp rag dolls. With his career high four points in one game, Kassian now has twenty three points on the season, also an NHL career high in a season for Kassian. To go along with his four helpers on each goal last night, in the first and third period he took the puck to the face, enduring some face time with the doctor and receiving ten stitches. Can you say beast mode anyone? The third line produced unlike they have been able to for the entire season. First and foremost David Booth deserves a ...minor mention. He finally broke his goal less drought of thirty two games. Booth's goal was an ugly one, and he did not have the greatest game, but the fact that he FINALLY found the back of the net was worth a mention. Scoring also came from Brad Richardson, and new comer Shawn Mathias in the first period, Yannick Weber with a tally in the second and the David Booth insurance goal in the third. You could say this game brought back a little bit of confidence to the team heading into the very late stretch of the season, but of course there are arguments against it; looking at the goalie they faced from Abbotsford, Nathan Lieuwen was starting in only his second NHL game, and of course facing off NHL's last place Sabres who have only forty-eight points on the season. I'm not one to try and knock a team, and I'm not going to do that here. The Canucks have played some weaker teams as of late, and have not played well against them, take the 7-4 embarrassment to the Islanders for example... For the Canucks to finally win a game so handedly is a nice thing as a fan, and it is a bonus to have been there. Rewind now to the opening of the game. Roll out the red carpet, and bring out a Swede. Henrik Sedin, who was joined by his wife and two sons, played his 1000th game recently, and on Sunday the Canucks presented him with the ceremonial silver stick. 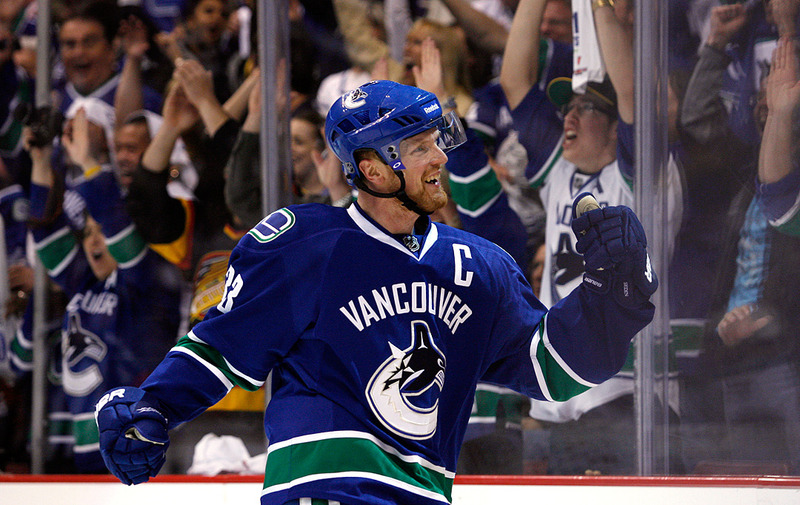 He has now become the first Vancouver player to play all one-thousand games in a Canucks uniform. The silver stick was presented by the steamer, Stan Smyl. It was a pleasure to see such a Canuck icon at the game and presenting Henrik with the honour. Sedin was also presented an engraved silver puck which his younger son tried to pry off of the plaque. This was followed by the revealing of a beautifully painted portrait of Sedin in which Kevin Bieksa and Daniel Sedin helped to reveal. This was followed by another heart warming moment by Henrik's younger son as Daniel jokingly pointed to the portrait and said that the painting was of their uncle and not their father. The young boy looked up at his father in confusion, in which Henrik then shook his head in laughter. It was a very exciting and emotional ceremony for the Sedin family, and he deserves all the praise in the world for what he has done for the team. Along with the stick, puck, and painting, Herik had $10,000 placed into a charity of his choice in his name by the team. As for the game, Henrik only played the first two periods, as he came limping off the bench at the conclusion of the second. Only to find out that he will be out of the line up for two weeks with a "lower-body" injury. Henrik has proven that he can go toe to toe with the best in the league, and can be considered one of the greatest Canucks captains of all time. He was a part of the Canucks team that was riding the "West Coast Express" with Brendan Morrison, Todd Betuzzi, and Markus Naslund. He has the most all time assists, the most assists in one season, most points in one season, and all time leading scorer in Canucks history. Not to mention his recently ended NHL iron man streak with the Canucks, that ended at 679 games. Add the accolades like his gold-medal in 2006 with team Sweden at the Turin Olympics. He led the league in points in 2010 winning the Art Ross trophy, winning the Hart Trophy the same year as the league voted him as the most valuable player to his team. Not to mention the President Trophies he helped the Canucks win in 2010-2011 and 2011-2012 seasons. Henrik Sedin has built himself an amazing legacy as one of the greatest to wear the Orca and the stick. He has brought smiles to our faces and likely some tears to our eyes, dare I bring up 2011. He still has a few more solid, exciting seasons left in his arsenal, as Canucks fans, you have a lot to thank Henrik Sedin for. Congratulations on your 1000th game Henrik. Here's to many many more! Nice post buddy, absolutely love it. As mentioned though too bad he's out now with a lower body injury! I love that vague term, but hopefully the Canucks can band together and win some games. Doubt it though. Hey Tyler do you believe Hank gets enough respect in our market? You seem to capture the heart so well. You make me give a damn about hockey! Props to Hank, I obviously haven't kept count but I have probably watched about 950 of his 1000 + games!